April courses begin on March 14, when instructors email the syllabus The focus weekend takes place April 8-9, and final assignments are due May 13 (if you take the class for credit). If you would like to audit a course, the tuition is $100. If you would like to take the class for credit, the tuition is $180. The cos﻿﻿﻿t (whether you audit or take for credit) includes ﻿﻿﻿meals and overnight accommodations at Upton Hall on Friday and Saturday night (on a space-available basis). If you wish to take the class for credit, we encourage you to enroll by March 13, as April classes officially begin on March 14. However, if you wish to audit the class, you may register at any time prior to the focus weekend. Christian History is an overview of the 2000 years of the faith. Topics include Jesus and early Christianity, transition from Jewish sect to separate religion, encounters with the pagan Greco-Roman world, the end of persecution, status as a state church, definitions of belief about Jesus Christ and the Trinity, expansion into northern Europe, the Reformation and Catholic-Protestant struggles, expansion of Christianity around the world, faith wrestling with the Enlightenment, what “Christendom” was and how it is disappearing, and the meaning of modernity and post-modernity. We will pay attention to Christians’ engagement with the world and service to the world. The Rev. Canon Dr. George Wiley taught religion at Baker University for 35 years and has been serving the Diocese of Kansas as canon pastor since 2014. He holds a Ph.D. in historical theology from Emory University. As a teacher, he is known for engaging with students and creating an inviting classroom atmosphere. Theology is, according to the famous definition of St. Anselm of Canterbury, “faith seeking understanding.” All those in spiritual relationship with God will seek to understand the Holy One better, both as a way of deepening one’s own discipleship and as preparation for effectively sharing the good news of the Divine Love with others. Lay and ordained ministers must be prepared to ably teach the faith of the Church (doctrine comes from a Latin word meaning teaching). The canons of the Episcopal Church require potential ordinands to be examined in the area of theology. Standards also apply to offices such as lay preachers and catechists. As part of the theological curriculum of Bishop Kemper School for Ministry, this course has been carefully designed to assure that persons will be well prepared to demonstrate their proficiency in Christian theology. 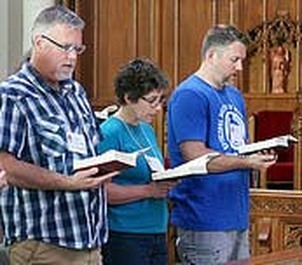 This course will introduce you to the ministry of Homiletics (preaching), to deepen your knowledge of the history of preaching, to familiarize yourself with various types of sermons, to understand the influence of the church year on preaching, and to provide you with the necessary skills, knowledge and abilities to develop, prepare, and deliver both a meditation and a homily. Craddock, Fred B. Preaching. Nashville, TN: Abingdon Press, 1985. Troeger, Thomas H. Imagining a Sermon. Nashville, TN: Abingdon Press, 1990. The Rev. George Pejakovich graduated from the United States Military Academy at West Point in 1967. He served ten years as an Infantry Officer, commanding two companies in Viet Nam. He resigned in 1977 to attend Lutheran Theological Seminary in Columbus, Ohio, but returned to the Army as a Chaplain in 1979, serving in numerous postings, and became the Commandant of the U.S. Army Chaplain Center and School in 1994. After retiring from the Army in 1999, he became pastor of a Lutheran congregation in Columbia, SC. He moved to Topeka in 2001, and since 2004 he has served as Assistant to the Dean of Grace Episcopal Cathedral. He resides happily with wife, Joyce, and a large standard poodle named Jaeger. This course is a study of biblical, historical, and contemporary issues related to the doctrine of salvation (soteriology). The focus will be on such matters as sin and salvation, the death of Jesus, atonement images and theories in Bible and history, and the contemporary experience of salvation. Schmiechen, Peter. Saving Power: Theories of Atonement and Forms of the Church. Eerdmans, 2005.